... while with boron the easy part is the handling. If drivers send slabs of (even less ignitable!) boria across the Earth, and get back boron, both forms' manageability helps this energy tap be efficient. No cars seem to use it yet. For a different style of exposition of — among other things — why they should, buy the new book Prescription for the Planet by Tom Blees. Also, read the recent publication: Cowan, G.R.L. (2008) ‘How fire can be tamed’, Int. J. Nuclear Hydrogen Production and Applications, Vol. 1, No. 3, pp.235–248. This work is Copyright © 1999-2009 Graham R.L. Cowan, and may not be reproduced by any means for material or financial gain without his written permission. Encouragement by John McCarthy (Progress and Its Sustainability) is gratefully acknowledged. These people link to it, as all are welcome to do. Pete's best guess as to when the worldwide petroleum industry's biggest year will be is 2017, when he expects 1.48 cubic miles to be extracted. Let's hope they don't spill it all in one place. The rotor spins somewhat like that of a turbine, confines working fluid in volumes that are sealed, like cylinders, so there are moving seals between it and a stationary wall, as in a Wankel, but perhaps there the rotor's centre of mass is not, as here, also stationary? "specializes in hydrogen separations and membrane reactors." Hydrogen flows through metals, some very much more than others. "Winners of the 1999 World Solar Challenge, Cut-Out Class"
Indirect solar drive via faraway boron-deoxidizing solar power stations is one possibility. But a solar electricity plant right on the car is a real engineering tour de force. Boron pieces on a 2004 penny. Larger B-bits will someday fuel normal cars, and may ride in bins in their bumpers or in the cabins. Tanks for today's substitute fuels are bigger and cannot be so freely sited. The case for boron as fuel could be said to begin with a difficulty: it is very hard to light. A long piece of the 140-micron boron filament that appears at left in short fragments can be stuck through a candleflame in air, and shine with orange incandescence where touched by the flame while remaining cool elsewhere, and in the first minute of such treatment not even warp. Eventually it does warp, but it never ignites. Where people can breathe, boron is the fuel that will not burn. But when they provide combustors that immerse it in oxygen at lethally high purity and pressure, it becomes the fuel that burns there, and only there, only where it is meant to. Highly pure oxygen is also the environment in which the burning of boron and certain other fuels is effectively emissionless (more on this in section Why Boron Motors Won't Emit). Boron-burning cars will naturally be — and maybe this is the main reason to develop them, and the safety gain is a side effect — zero-emission vehicles. It's between elements six and one, between carbon, whose diamond form it slightly resembles , and hydrogen, which has a long history as an experimental zero-emission car fuel. Gaseous oxides of carbon on their way to being emitted will soon be turning a billion non-experimental driveshafts. A little later, driveshafts in service will be several times more numerous still. Clear boron oxide disk on black background. Poured as viscous liquid at or above 500 Celsius, it cooled through a glass transition temperature a little below 200 Celsius and was rock-solid from there on down to room temperature. Since the burning of boron must produce boron oxides, and they won't be emitted, what will happen to them? Actually the cooled effluent of a boron-oxygen fire can include only one oxide, the transparent solid shown at left, boria . If the atom ratio of the fire's oxygen and boron feeds is not exactly the three-to-two that exists in boria, oxygen or boron will be left over. This may not seem remarkable, but compare a fire that is being fed carbon. Normally its carbon comes off fully burnt, as dioxide, but with insufficient oxygen it comes off as carbon monoxide. Individual atoms burn halfway. No such thing can happen with a fuel boron atom — neither gasification, nor partial oxidation. It emerges from the fire either in solid boron or in boria. The latter's fate is to solidify with a smooth surface and no internal grain boundaries (hence the transparency), stay a while in a glass lump bin, and then return to a power station to be deoxidized again. Thus boron ash returns to where boron fuel was sent from. Ignition resistance in a fuel is a good thing. Traditional fuels' lack of it has figured in many very serious accidents and acts of sabotage. But as noted in section Boron the Unignitable it doesn't by itself make boron unique or even very unusual. What is unusual, and helps make this alternative fuel truly an alternative with a difference, is its high energy density, per pound and especially per gallon. A chamber for it plus a bin for all the glass ingots it will become would together be not much larger than the liquid hydrocarbon tank they replace. Sections Boron the Dense and If a Car Retains All Its Ash give comparative data. A compact energy reservoir should mean plenty of range. Release of the energy in a hot flame at high pressure should mean good ratios of power to mass in boron motors, and quickness in boron cars. People who read about global warming will want them, but so will people who don't read the papers at all. Voluntary customers will line up around the block. Where Has Boron Been Hiding? Can boron power be as good as is here let on and yet not have been envisioned before? At least one necessary technique may be intractable or may only recently have ceased to be so: Purifying Air Oxygen On Board a Vehicle in the quantities necessary to power that vehicle. Also, once pure oxygen is available, it will have to be prevented from burning the motor along with the fuel. The section titled Is This in Any Way New? briefly discusses an investigation of decades ago that may have put people off. Some still confuse boron with boranes. Beginning with section Boron of the Bright Flame basic data pertinent to boron's performance as a fuel are presented. How can hot combustion in a flame be reconciled with zero emissions? Nature's answer seems to be that the flame should be that of boron burning in pure oxygen. Uniquely among fuel ashes, its oxide combines fluidity at hot motor temperatures with stony solidity below 200 Celsius — although unfortunately not complete waterproofness — so that it can readily be shaped by molding, or as shown below, by pressing. That such ingots will in fact be made is ensured not just by boria's cooperative nature but also by boron's salvage value. Vehicle operators need not be as nice as boria for this to work. All the ash will be retained and recycled (cf. Boron Decombustion), none will be emitted. Power-generating internal boron combustion also doesn't lend itself to burning and emitting nitrogen. Boron fuel cells may be possible , but, unlike the case with hydrogen, would have no edge in cleanliness over boron combustors. Cars in which boron fuel simply burns will be true zero emission vehicles. Some of what boron can do, anything that burns to an involatile ash can in principle do too. Magnesium, chemical symbol Mg, is a good example. Seven pounds of it carries as much energy as three pounds of boron (cf. Boron the Energetic). If it were burnt in excess pure oxygen, the only chemicals downstream of the flame would be gaseous oxygen and solid particles of magnesium oxide (MgO ). Some of this fine dust would readily fall out. A remnant would make the mixture appear as white smoke if it were released. But it's nearly pure oxygen. Releasing it would make no sense. If instead it is sent back to oxidize more magnesium, it does this just as well as new oxygen. The suspended ash from last time doesn't interfere. Nearly pure oxygen isn't free, but this way very little is wasted. Each atom of leftover oxygen emerging from the flame is repeatedly sent back until it is consumed. No large volume of gas ever gets out. The only final effluent is precipitated MgO powder, plus a little entrained oxygen between grains and on their surfaces. almost nothing but dense precipitated ash comes out. Courtesy C. E. Jones, University of Texas Austin. Allows, but does not require. Many of us have ignited magnesium ribbon in air with a match. If there were some reason to run cars on magnesium, they too could burn it in plain air. But using plain air would inevitably lead to ash venting. As with pure oxygen, some ash would remain in suspension, but now the gas it would be in couldn't return to the flame. Having begun as air, 78 percent nitrogen, it would have an even higher nitrogen content after one flame pass. So it would be trash. It couldn't go back and react more. Nothing could be done with it except dump it as waste gas. With it would go the magnesium oxide that didn't precipitate and the (generally considered harmful) oxides of nitrogen. So if metallic magnesium existed in huge natural deposits, car makers designing for it might face a moral dilemma. Take the pure-oxygen high road? This gives a zero emission vehicle by eliminating oxides of nitrogen, even though they would not be visible anyway. It allows all the (low-value) MgO to be kept on board, and so puts the operator in charge of it, willy-nilly. Or simply burn it with air and let the smoke and fumes go? No. One could never get away with discharging boria as smoke. The particles would quickly combine with atmospheric water vapour and become boric acid particles. Boric acid is soluble, and like oxygen can enter the bloodstream through the lungs. In small quantities it may be necessary to animal life, and is definitely harmless, but the tonnes per day that could be generated at a busy urban intersection would be intolerable if dispersed there. No. One could never get away with losing boria as smoke. Unlike magnesium, boron is a somewhat rare element. In recent years its mining cost has been roughly one order of magnitude more than the retail cost of the energy it can carry. If it made only one trip, boron to deliver a dollar's worth of energy would cost roughly ten dollars. Economy requires the same boron to be used many times. The ash must be kept. No. Pure solid boron needs concentrated oxygen just to light (cf. Boron the Unignitable). There is no prospect of setting it on fire just with air. The last point really may be only 0.99 of a No. The crudest oxygen pure boron can readily ignite in is not as dilute as air, 21 percent, but still may be substantially below 99 percent. It doesn't matter. The first two factors push the required oxygen purity from wherever that minimum is, on up to High. They do this by demanding the combined level of all other gases, which sweep ash out rather than becoming part of it, be Low. But the unignitability factor backs them up. It guarantees that even if there were no reward for keeping boron ash, and the penalties for its dumping were either nonexistent, or limited to persons other than the customer, a designer still couldn't delete the oxygen separator. See also Internal Boron Combustion Engine Considerations. In general if a fuel has involatile ash simplified combustion is merely possible, but with boron it's the only possibility. This means oxides of nitrogen will not be formed, as said at this section's beginning. Nitrogen is kept out of the boron flame primarily for other reasons than preventing this oxidation, but even so it is prevented. One reader suggests aluminum's boron-like ignition resistance and the limitless availability of its oxide (the mineral corundum) might make it preferable despite a weight penalty (cf. Boron the Energetic). But while boron is rare to what seems like just the right degree, aluminum's very abundance would tend to zero the salvage value of its ash. Like magnesia, it would in all likelihood be dumped. Maybe as smoke, maybe in bags, but in either case no-one's name would be on it. Basic boron data follow. The main introduction is above. Starting from 25 Celsius, pure boron and a four-thirds excess of pure oxygen at 100 bars pressure reach a maximum flame temperature of 4,370 Celsius. Under the same starting conditions hydrocarbons and hydrogen burn cooler by about 1,000 K .
Here are the basic oxidation process data for boron and some other materials at 25 Celsius. The energy yields are shown as negative numbers because before reaction the energy is in the reagents , and when they react they lose it. The above data compare oxidizable atoms one for one. So they compare one mass of hydrogen to 26.77 masses of aluminum (Al), 11.92 of carbon, 10.73 of boron, and 4.36 of 3-ethyl-3-methylpentane, an octane isomer that is a fairly representative component of gasoline (petrol) . Since aluminum and boron atoms similarly combine with 1.5 oxygen atoms each, and per aluminum atom the yield is more, an aluminum-oxygen flame should be hotter and brighter than a boron-oxygen one. No photo of the boron kind is available yet, but a large aluminum one can be seen in section Boron the Unignitable. Removing the minus signs, inverting (e.g. rewriting 791.15 kJ per mole of aluminum as 0.0012640 moles of aluminum per kilojoule), and multiplying by molar masses and volumes gives fuel mass and volume requirements per unit energy. The next several sections do this arithmetic for the above substances and some others. Smaller numbers are better, and where display and browser permit, they appear on darker backgrounds. ... and Energy-Specific Ash Mass gives the post-oxidation masses. The amounts of oxygen taken up are the subject of Boron the Oxygen-Sparing. Only light elements carry oxidation potential energy lightly. At 30 kg/GJ carbon's entry is less than any in the rows below it, and would be so even if the whole periodic table were included. The fifth, fourth, third, and especially the first element, hydrogen, all come in lower still; and by virtue of containing a little hydrogen, so do today's fuels. They are complex mixtures of liquid compounds that mass 20 kg or more, mostly carbon, per gigajoule. One compound fairly near that minimum has been allowed to hide among the elements above, but can be spotted by its noninteger atomic number. Its presence highlights the fact that while boron's kg/GJ score is more than twice hydrogen's, it is still entirely below the range of today's fuels. When we produce energy by fuel oxidation, we are also producing it by oxygen reduction. Some fuels reduce more kilograms of oxygen per gigajoule yielded, and some fewer. Data follow. Boron is a fairly deep chemical energy well for oxygen, less so than metals just below it and to its left, but in section Energy-Specific Ash Mass, when its own lightness is added in, it beats some of them. Hydrogen, carbon, and a typical fuel hydrocarbon take almost twice the oxygen boron does. Here are the kilogram amounts of oxide produced by complete oxidation of a gigajoule's worth of various substances. The space these oxides might be packed into is given in section Ash Volumes. Section Boron the Energetic gives the pre-oxidation masses. Boron scores lower than carbon and a typical fuel hydrocarbon in Boron the Energetic and Boron the Oxygen-Sparing, but higher than beryllium . The same order exists here because this chart just sums those other two . Hydrogen's entry shows that it isn't the lightest of oxidizable fuels if the weight of the necessary oxygen is counted. Carbon, hydrogen, and their compounds might be considered as making no ash at all, if fuel-oxidation-derived invisible vapours didn't count as ash. In this document, they do. Below are the various light oxophiles' volumes in litres per gigajoule of oxidation potential energy. The corresponding masses, kilograms per gigajoule, are given in Boron the Energetic. Section Ash Volumes shows the large expansion or shrinkage that can result when oxygen attaches itself. In section Let Your Car Bore On boron's decent showing is partly due to its being tops here . In how few litres of space can the oxide from a billion joules' worth of oxidation fit? Below are some data. The masses of these amounts of oxide are given in section Energy-Specific Ash Mass. Section Boron the Dense gives pre-oxidation volumes, not including uncombined oxygen volume. In Let Your Car Bore On fuel and ash volumes are combined. The eight small values of which aluminum's 16 L/GJ is typical are oxide crystal volumes for the stablest forms at room temperature and pressure. So if an aluminum-oxidizing power system dealt with its ash by making it into a huge flawless sapphire, that is how big the sapphire would end up. This would not actually happen. The two largest values, carbon's and 3-ethyl-3-methylpentane's, are about 400 times smaller than they would be if their carbon dioxide volume component referred to the room-temperature, room-pressure gas. In fact it is counted as pressurized room-temperature liquid. The 79 L/GJ entry for hydrogen is the best approximation to the volume an ash chamber in an actual power system would need, because liquid water packs down well. It is also the ash least likely to need keeping at all. How big are the tanks, really? Answers are given here in terms of litres per three gigajoules, not one, because 1 GJ of fuel energy propels a typical car only about 300 km, and 1,000-km range is not very unusual. The 140-L entry for boron is 108 L for ash, 32 L for fuel . This is based not just on tripling the data from Ash Volumes and Boron the Dense but on multiplying them by further factors of roughly 1.5 . These extra adjustments allow for imperfect packing of solids. For liquid ammonia and liquid hydrogen those two sections' data, summed and tripled, exceed the fuels' entries in this chart. Only contained volume counts here, and these fuels' ashes need no containment. They can disperse harmlessly into the planetary atmosphere. Using that same convenient ash bin, 3-ethyl-3-methylpentane and carbon show the same fuel-only compactness to a much greater degree. Carbon-free fuels can fit in reservoirs nearly as small, but only if they are also hydrogen-free, and much of the enclosed space then is for ash! Boron's unique compactness suggests a car burning it could easily have transcontinental range. However, boria needs to be recycled. The simplest way to ensure this happens is to keep it all on board until it can be swapped for more boron. That means a 1,000-km boron fuel reservoir's worst-case volume is the sum of the volumes of 1,000 km worth of boron before use and the same boron in oxide form after use. The table below shows this sum is 129.9 litres. A representative liquid hydrocarbon looks a little better at only 90.3 litres, but this includes no space for waste oxide . In practice, since boria is solid, it has a packing fraction — there are voids between lumps — and the total volume may be more than 129.9 litres. Perhaps as much as 150 litres, 66 percent more than equivalent gasoline (petrol). This is less than half the 373.8 L liquid hydrogen volume . Boron's major safety advantage is that it strongly resists ignition. C.E. Jones, U. Texas Austin. Shown are a few milligrams of pure boron particles sitting inert in air, although nearly red-hot, on a borosilicate glass dish. If they were to oxidize slowly, they would literally fade into the background. What stops them may be the formation of a heat-resistant oxide film . If on each tiny grain the outermost few layers of atoms did oxidize, they might then, as oxide, protect all the much more numerous atoms within. This helpful behaviour is commonplace among metals but unusual in nonmetallic elements. It is unusual in fuels, except for one odd case of a fuel that is a metal, and has a very high flame temperature, and in air can't be ignited with a blowtorch because its superficial oxide layer is so strongly protective. Oxidation yields the same energy with three pounds of aluminum as with only two pounds of a typical hydrocarbon (cf. Boron the Energetic). But combustion rockets must lift oxygen as well as fuel, and when both reagent masses are accordingly counted, the totals come out near six pounds for aluminum versus nine for the hydrocarbon (cf. Energy-Specific Ash Mass). Some rockets therefore run on solid propellant that is a mixture of finely divided aluminum, solid oxidizer, and glue. The bright plume from such a rocket is shown. Yet every day millions of pots with aluminum alloy bottoms are put on red hot stove coils by millions of people who quite sensibly give no thought at all to the potential for aluminum combustion. None occurs! When the pots are forgotten, whatever is in them first boils or burns away, and then near 600 Celsius the aluminum melts and runs down through the coils. It does not ignite. Aluminum, the next heavier element after boron in the periodic table column they share, actually isn't very much like boron. But the similarity in resisting ignition and oxidation is close. The familiar example of aluminum is a good guide to boron's ignition behaviour. There are some minor differences. Boron's oxide coat is unusual in that at temperatures between 450±2 Celsius and roughly 2,000 Celsius it is a very viscous liquid coat. Also, boron itself is still solid at 2,000 Celsius. So at temperatures like those of the boron photo, boron is a solid protected by a liquid oxide film, and aluminum would be liquid protected by solid. It melts 660.37 Celsius, its oxide melts at 2,015 Celsius. A liquid boria film's high viscosity makes it act just like a solid barrier, except that if a gap somehow forms, and air gets momentarily through, the gap tends to get resealed not only by the creation of new oxide but by the lateral flow of the oxide next to the gap . This thick fluidity also prevents gaps from being created in the first place. Liquids have no cracks. In most metal oxides and in boria the oxidized atoms are farther apart than they were in pure element. So an oxide coat that gets thick gets too big for the metal object it is growing on. This is true for aluminum and beryllium, but not for magnesium. Magnesium atoms in the metal get closer together when oxygens take up residence between them, so an oxide coat develops tension, not compression, as it thickens. Cracking and shrinking, re-exposing naked metal, would help to explain the unboronlike behaviour shown in the section titled Why Boron Motors Won't Emit. A hot boria coat can flow, so despite the boron atoms' moving apart on oxidation no compressive stress builds up. No matter how thick the coat gets it remains seamless. No oxygen can penetrate it except by diffusion. When a coat reaches more than a few microns in thickness this becomes a slow process . Another way this nonmetal differs from combustible metals is its great inertness at room temperature. Aluminum seems inert because its oxide coat is inert. A bare aluminum surface reacts instantly with air or water. The water reaction can be confirmed by putting an aluminum surface under water and there scratching it with a file. The new surface takes oxygen and leaves hydrogen, which appears as minute bubbles. However, a naked boron surface in air can remain naked, or cover itself only with adsorbed air molecules as graphite does. This paradoxically means it may be possible for a suspension of fine boron dust in air to be explosive, like flour or cornstarch. Finely divided boron is very abrasive, so even if it were too coarse to stay aloft it would not be a preferred fuel form. The essence of boron power is compact energy storage in innocuous dry involatile solids. Consistency with this demands that oxygen be taken from ambient air. It will not come from onboard tankage, for if so kept it would be hazardous, bulky, volatile fluid. The boron power system it was in would thus be a travesty. But as shown in Boron the Unignitable, boron is unignitable in the 21 percent oxygen that air is. Although it might light pretty well in 70 percent oxygen, compelling advantages of economy and cleanliness are gained if the purity is much nearer 100 percent (cf. Why Boron Motors Won't Emit). So when boron power systems take oxygen from the atmosphere, they'll take it neat, and leave the other stuff outside. Suppose a heat engine turns 30 percent of the thermal power it generates into mechanical power and lets the other 70 percent depart unconverted. An oxygen purifier will probably have no use for the waste thermal power; instead, it will demand some of the scarcer resource, the mechanical power. Will it demand all 30 percent? Will it demand all that and another thousand? No. They don't, and probably would burn up in it. But if they did need it, they wouldn't be stuck. At the supposed 30 percent gross thermodynamic efficiency, they consume 260 kg of oxygen for each gigajoule of produced mechanical energy, according to the data in section Boron the Oxygen-Sparing. This particular proportion of energy to oxygen has not figured in the design of today's air separators. A high (kg O2)/GJ number has been only one of several goals, and getting it well above 260 has not been critical. Nevertheless, it is there. Industrial-scale zeolite-based oxygen purifiers today give 430 (kg O2)/GJ. If one of these had wheels, and its power source were a built-in hydrocarbon motor, and the motor had no source of oxygen but the purifier's output, it would be more than enough. 170 (kg O2)/GJ would be net product. Alternatively, the net oxygen output could be zeroed, the motor taking it all, if each motor output gigajoule were divided into 600 megajoules for the purifier and 400 MJ for the wheels. The thing could go. Section Boron the Oxygen-Sparing also reveals, not without forewarning, that boron motors will need less oxygen than today's. At the supposed 0.30 gross thermodynamic efficiency, they will need 140 (kg O2)/GJ. That means the self-powering, self-propelling oxygen purifier with its hydrocarbon motor replaced with a boron one could apportion a gigajoule of motor output thus: 330 MJ for the purifier, 670 MJ for the wheels. One useful attribute for industrial oxygen purifiers is the ability to stay in place and working despite occasionally being backed into by forklift trucks. They are sturdy . Converted to self-propulsion, they would not be fast rides, but they'd be faster with boron motors than gasoline ones, especially if both types of motor were scaled to drive the purifier at the same throughput. The first line is the absolute minimum energy cost of purifying oxygen, setting aside the other gases that do not support combustion. They are denoted by "azotics" since they also don't support life. The second line is how much energy the oxygen then can yield with boron. In theory, then, one watt of power fed to an oxygen purifier could be deducted from 130 watts yielded by a boron power system downstream of that purifier. In reality that can never happen, but one can do a lot less well than that, and still do very well. Cobalt atoms magnetically aligned on polymer backbone. Oxygen is the only common substance in air that is weakly attracted by a magnet. Other gases are weakly repelled. Polymers have been made experimentally that contain rows of aligned tiny magnets — cobalt atoms. These rows act as corridors that hinder the motion of oxygen molecules in directions not parallel to the polymer chain. Both diagrams courtesy H. Nishide. Other types of molecule will diffuse in all directions, but dioxygens will hop along the polymer backbone. The diffusion rate of oxygen is claimed to be 40 times that of nitrogen . That means two stages of filtration through this material would give adequately pure oxygen for a boron motor. The first stage would raise the ratio of oxygen to nitrogen from the 0.26825 that exists in air to 10.7, and the second would raise it over 200. Efficiency might require this to be done at high pressure. Pure oxygen and a hydrocarbon polymer could not then safely coexist. One useful development of this technique therefore would be to replace the organic backbone with one that was already full of chlorine, oxygen, or fluorine, i.e. a ceramic, or maybe a halocarbon polymer. The Earth contains uranium and thorium that over a two-million-year period could produce 175 petawatts (175 PW, 175 trillion kilowatts). This is also the total power of the light and other radiations that continuously come to Earth from the Sun, and are reliable for the next 2,000 such periods at least. Averaged over its lifetime a modern car's power draw is a few kilowatts. Appropriating the whole 175 PW to support 50 trillion cars and drivers probably is a bad idea, but diverting an unobtrusively small fraction will still support many billions of them. So the Earth can't be short of propulsion power for vehicles, not now and not in the year 1000000. Or at least, it can't be if solar or nuclear power can be brought to bear on ash from combustion motors in such a way that it turns back to fuel. What follows is one possible way to do this with boria, a way that takes most of its input energy in the form of heat. First the boria will be melted and have sulfur vapour bubbled through it. Sulfur likes to combine both with oxygen, making sulfur dioxide, and with boron, making diboron trisulfide. If, as seems fitting, this reaction occurs then the two sulfur compounds won't stay together. The sulfur dioxide will stay in the gas bubbles, and the boron sulfide in the liquid, which will become mixed oxide and sulfide. The positive number in the third column above means that at 25 Celsius the sulfur compounds in the Products column are that much higher in energy than the sulfur and boria in the Reagents one. What could provide the extra energy? Heat. Sulfur bubbles will be injected at the bottom of a vat of liquid boria that will start out hot, around 1,000 Celsius. As they rise through the liquid the bubbles will lose sulfur to it, take oxygen from it, and even if the vat is well insulated, the whole mixture will cool. Heat will have been transformed into chemical energy. If this continues the liquid will cool and stiffen until bubbles are effectively trapped. Heat from a solar collector or nuclear reactor must be added. When this is done, a continuous countercurrent process is possible: pure boria in at the top, partially sulfided material out at the bottom. Pure sulfur vapour in at the bottom, partially oxidized sulfur out at the top. Constant temperature maintained by constant addition of heat. Does this give us the indirect nukemobile and the indirect solar car? Not quite yet, not unless they can usefully burn impure boron sulfide, and they can't. Plus, so far, much of the energy in that sulfide isn't solar or nuclear, it's sulfur energy. There is sulfur in the Earth, but if burnt at 175 PW, it would all be gone in a few minutes. Also the resulting sulfur dioxide shouldn't just be let go. Because boron and oxygen burn so strongly together, getting them apart again is hard. This first step may seem to have, indeed it has, accomplished this at the expense of creating two new problems, but they're both easier problems. The fate of the sulfur dioxide will be discussed a little later. For now the focus is what happens to boron sulfide. Mixed boria and boron sulfide emerging from the bottom of the sulfur percolation vessel will enter another vessel and have another gas bubbled up through them. The gas this time is the halogen, bromine. The boron atoms that lost their oxygen to a bubble now will be taken off as gas in their own turn. The negative number in the right column shows bromine would consume boron sulfide, converting it to a gaseous mixture of tribromide and sulfur, even if the gases remained mixed with the liquid sulfide, even without any addition of energy. This treatment dismantles and lifts out all the boron sulfide and leaves the boria alone. So the liquid becomes once again pure boria, not quite as much as first entered the sulfur percolation vessel. It will return there now, along with additional boria to make up the loss. Since boron is dark brown (see photo in introduction) and hydrogen bromide, hydrogen, and boron tribromide are all transparent, there is an interesting possibility of using intense light directly to heat the advancing boron surface. Here are the above five steps all together. A combustion process that goes forward in one step has been forced backwards in five. — Approximately five. Sulfur dioxide and hydrogen bromide decompositions aren't as simple as above shown. Followers of the long-rumoured "hydrogen economy" will recognize the similarity to thermochemical water-splitting schemes. But those schemes had fewer steps, because from hydrogen down to water it's energetically a lot less far than from boron down to boria. Is the increased complexity worth it? One reason why it actually seems like a pretty good bet is this: it never hurts to make some boron ahead. Consider two power plants. Each turns 20 or 30 gigawatts of heat into 10 GW of chemical fuel. This is larger than usual for electric power plants today but an ordinary size for oil refineries. One makes hydrogen, the other makes boron. If the boron plant has no takers for a couple of weeks, it can stack boron outside, perhaps on pallets, 40 acres six feet deep. Rain won't hurt it. The hydrogen plant might also store two weeks' production, not, of course, in contact with the elements — earth and water are OK, but definitely not air or fire — but perhaps as the inflating gas in a kilometre-wide gas supported tent 250 m high at the centre. This is about five times more area than the pallet field, and seems certain to cost more per unit area. There is enough boron on Earth that plants rely on it to be in their soil in dissolved oxide form. They suffer if there is too much or too little . A million tonnes of seawater contains 4.4 tonnes boron. This makes the oceans a reserve such that if the first pound is not too expensive, many more pounds are available at the same price. After a thousand cubic miles of boria have been removed, the concentration still is pretty much as it was. One way to extract it would be to impound a large amount of seawater and let it dry up. Different components of sea salt precipitate at different times as the salt concentration increases and it is possible to get a borate layer. Nature has done this, and on a scale large enough to support an industry that annually extracts ready-concentrated, cheap borates containing a quarter of a million tonnes of boron . Much of this boron has passed through people's houses, particularly their laundry rooms, in the form of perborate bleach or borax. Much less than one percent has been separated from its oxygen. Is It Possible to Run Out? Known reserves are several tens of millions of tonnes of boron. At current consumption rates, mostly for glassmaking, that is several times 40 years' worth . Each boron car that comes into being will require some kilograms on board, and a few times that much in transit to and from a decombustion plant, but once this has been provided it can just keep going around. One way to look at the boron atoms is as a multitude of little energy-transfer machines, incapable of wearing out, easy to keep herded together both when laden and when empty. So there is plenty of boron for a few hundred million boron cars. When more are desired, it may be necessary to bring a minute fraction of the ocean's boron onto land. Coils of boron filament can get from the plant that makes them to the devices that burn them by any ordinary kind of freight carrier, with none of the restrictions necessary for today's energy-bearing chemicals. One could mail five pounds of boron in a parcel but the mails will not accept a gallon of gasoline. It also is very easy to store boron. When buying a car one could buy a lifetime supply of boron coils for it and keep them in the back yard. One would probably prefer to have them under some kind of cover . The awkward but interesting parts come after the boron has been burnt. If we visualize a small piece of boron filament passing through a reaction zone where oxygen consumes it, immediately downstream of the zone we see it as a short section of a stream of very hot, very luminous boria vapour. In a heat engine this will not be the working fluid all by itself; it's too hot. Rather, its heat must be spread through some surrounding fluid by mixing and by absorption of its light in that fluid. Suppose for a moment that the mixing mass ratio is four masses of fluid to one mass of boria, and the fluid is helium . Helium molecules are much less massive than boria ones so a four-to-one mass ratio means a 70 to one molecule ratio. Heat capacity is per molecule so a good approximation of the temperature rise can be found by treating the helium's constant pressure heat capacity as the only heat capacity present. 715 K is the result. The temperature rise will be less if the boria remains in the vapour state; but it won't. For reasonable or even enthusiastic starting and ending temperatures, e.g. 700 Celsius start, 1,415 Celsius end, it will condense. It will exist as an aerosol, or perhaps a helium-osol: a suspension of liquid droplets. If the aerosol now expands through a gas turbine, many of the droplets will stick to the turbine blades and run down them. Since they are rapidly rotating, "down" is not towards the centre of the Earth, it is towards each blade's outer end. So at first glance a gas turbine seems to lend itself to continuous separation of boria from the working fluid . Is a Gas Turbine the Way? Let's assume so and see where it leads. Something will have to happen to the parcel of oxide when it gets to the ends of the turbine airfoils. The centrifugal force field strength is at its maximum there, so as long as a path is open to the oxide that lets it continue to get farther from the axis of rotation, it will keep moving. Since the turbine channel where this is happening is an expansion channel, the working fluid gets to wider places as it moves along and works. The liquid boria can get farther out by going in the same direction. The fluid is getting cooler. Since the boria is flowing along parallel, it too may be cooling . This will make it more viscous. Where boria finally exits the expansion turbine a glass-molding mechanism can take it and shape it. It can be worked by the same methods as ordinary bottle glass, but at a lower temperature. The temperature where the viscosity of a type of glass is one million times that of water at 20 Celsius is known as its working point, and for bottle glass it's between 1,000 Celsius and 1,050 Celsius. For boria it's 550 to 575 Celsius. In a big car that is already at highway speed and accelerating rapidly the motor might be pulling boron filament in and burning it at the rate of 0.014 kg/s . This gives 810 kilowatts of heat and 0.045 kg/s of boria glass. That is 25 cubic centimetres per second, about the rate a toothpaste tube will give if you squeeze it with your fist. If the molding machinery forms the oxide into balls 4 cm in diameter, 33.5 cubic centimetres in volume, its maximum production rate is one every 1.35 seconds. When the car is going along at a constant highway speed, this slackens to one every 10 or 15 seconds. These glass forms must be cooled and put in a storage bin to await recycling. The very high temperature of the boron-oxygen flame makes it very luminous. Rather than letting the light fly all the way to the combustion chamber walls, it will probably be beneficial if the motor quickly causes the energy to be transferred to the working fluid. This might happen through the fluid's absorbing the light, or through its being promptly mixed with the flame, taking the energy by thermal conduction before it can be emitted as light. This light might work out as a good thing if its fast flight allows fast energy transfer . However, it's hard to see how the working fluid could be dark enough. The thermodynamic cycle now envisioned is a nearly closed one. Pure oxygen and boron are injected, and pure boria is drawn off. This means oxygen must be separated from air. A filter using hot metallic silver seems like one possible way to do this. Under pure oxygen at one bar, 0.1 MPa, of pressure 20 volumes of oxygen can be taken up by one volume of liquid silver. Oxygen-laden liquid silver spits as it freezes because the solid can't accommodate as much. But it still takes a lot, as is illustrated by the phenomenon of "firescale" in copper-silver alloys. When they are heated in air, oxygen finds its way through the silver to oxidize copper far below the surface, and the copper oxide heaves up bumps in that surface. Oxygen must not only go into silver but be forced through it with a pressure gradient. This silver filtration will take power, more research is needed to determine exactly how much, but oxygen purification, by this means or some better one, is essential to an internal boron combustion motor. If the oxygen is pure, boron burns better. In air it may be practically unignitable, in the sense that even if you run a large electrical current through a boron bar, and keep it so hot that air eats away at it and eventually through it, you end up putting more heat in with the electricity than comes from the burning. Once the circuit is broken, the rate of oxidation is not sufficient to keep the two parts hot, so the fire goes out. If that is true, then a higher grade of oxygen — air is only 21 percent — is essential for that reason alone. But does the grade have to be in the high 990s per thousand, as a silver filter provides? Boron must burn a little more readily in 99.x percent oxygen than in 70 percent, but if 70 percent is enough for the flame to sustain itself, isn't that good enough? No. Given that a filter is necessary in the first place, there is a compelling reason to make it a good one: with pure oxygen going in, no gas needs to come out. All the gas that enters the combustion chamber combines with boron to form a dense liquid. Suppose the oxygen were cut with several parts in 20 of an inert gas, e.g. neon. An exhaust gas port would have to exist so this neon could get out again. Since it and any oxygen left over from the flame are both gases and not separable, oxygen would have to be let go with it. 0.0216 kg boron combines with 0.048 kg oxygen to yield 0.0696 kg boria, but to make this happen, maybe twice as much oxygen, 0.096 kg, would have to be pumped in, and half of it would blow out again. Although by the time the gases reached the exhaust port most boria would have fallen out, some would still be gas-borne and would go out with the oxygen and neon. Thus we would have nonzero emissions. Much heat would also go out the port. In sum, several kinds of waste would result: waste of oxygen, waste of heat, waste of boron. Plus the extra complexity of needing a gaseous exhaust port in the combustion chamber, in addition to the other exit that lets liquid boria out. For these several reasons, if we lived on a planet whose air was 79 percent neon, 21 percent oxygen, we would exclude the neon from our boron-burning motors. But nitrogen is the main diluent of the oxygen we breathe, not neon, and in a hot flame nitrogen is not inert. A small amount will combine endothermically with oxygen, stealing combustion energy and making gaseous oxides of nitrogen. These are noxious pollutants, as suggested by their generic chemical formula, NOx. Nitrogen in a combustion chamber is a real nuisance, but in a boron combustion chamber the same purification of the oxygen supply that would be correct design on any planet covered in dilute oxygen eliminates the nitrogen problem on this, our actual one . The working fluid is expected to be more of this same atmospherically extracted oxygen, making doubtful the idea of pigmentation to aid absorption of boron-oxygen flame light. What coloured gas or vapour will stay with the high-pressure oxygen through very high temperatures and lower ones, and not lose its colour? But if there is such a pigment, its use will be a little easier if the same oxygen is used again. The pigment won't escape, or at least no more of it than will dissolve in the boria. Finally, a closed cycle allows the use of a recuperator and so increases heat-to-work conversion efficiency. Centrifugal force field strength is zero at the axis of rotation, and therefore a turbine that combines its power conversion function with centrifugal separation of liquid boria from gaseous working fluid will have no control over oxide that adheres to surfaces there. It might cause a rotor imbalance. A peripherally borne rotor may be a solution. This is an inside-out turbine rotor whose centrifugal weight is borne by tension in a hoop. Rather than hanging outward in tension the turbine blades are supported at their outer ends, by the hoop, and reach in towards the axis. They bear their own centrifugal weight as a compressive load, plus bending load from the fluid. They don't reach all the way in. There is a clear channel down the middle. Where boria could stick to unaccelerated surfaces, there are no surfaces. This is different from the usual turbine practice of having the outer ends of the blades clear the housing by a small but safe margin. Fluid in that margin is affected partly by neighboring fluid that does not miss the blades, and partly by the wall. Here the blades go right to the wall, and are part of it. It is at their other ends that the fluid can go by out of reach. The unswept region is a circle of small radius rather than an annulus of large and nearly equal inner and outer radii. Plus it is bounded only by blade tips. Turbine motors have continuous combustion but it's also conceivable that a boron engine could have pulsed combustion like the piston-in-cylinder hydrocarbon engines we have today. A boron diesel engine — ignition by compression — could have an exceedingly high compression ratio because even in highly compressed pure oxygen boron won't ignite until the oxygen is very hot. However, experiment reveals that even at bright red heat boria still is a stiff fluid. At temperatures below the melting point of iron it is unlikely to be a good lubricant, and the cylinder walls are a large unaccelerated surface it would stick to. There it would impede the sliding motion of the piston. So an annular turbine rotor still is the best of the ideas so far seen. Pure boron is easy to handle . Combination with oxygen makes it less wieldy, mainly because the oxygen-to-boron mass ratio is 2.22. The resulting colourless clear glass is also not as perfectly water-resistant as boron. Pure boria probably does not occur in Nature, for when liquid water gets at it they unite as boric acid. This does have limited occurrence as the mineral sassolite. The lightness and wieldiness of dry boria is key to a scheme where a solar power plant sitting motionless on one side of the Earth can power many fast-moving vehicles on another. What it would do is separate boria into boron and oxygen. One method is proposed in the section titled Boron Decombustion. Equally many cars might derive the same total propulsion power if the plant made some other fuel for them, but then it would have to be bigger. One reason is that no matter how boria is broken up, it takes much energy, more per kilogram than for most other compounds. Otherwise said, a given quantity of energy will break up a lesser mass of boria than it would of most things. If this relatively small mass is hauled across the face of the Earth and then split, the ratio of transport energy to separation energy will also be smaller than it would be for most other compounds. When boria is split the oxygen becomes gaseous, as it is in air, and the boron becomes a dark brittle crystalline solid. This hard, inert, insoluble substance very effectively stores much of the energy it took to make. Being just 31 percent as massive as the oxide it came from, it can return to the point of energy demand at the cost of somewhat less shipping energy than it took coming in. Unfortunately not 69 percent less, not if it returns in the same carrier. With some difficulty it can be burnt there. This, it turns out, yields much more energy than was taken by transport both ways. Boron is an efficient energy carrier. Cars that burn it can be efficient indirect nukemobiles if the energy it carries originates in a nuclear reactor. If a large modern marine bulk carrier were boron-fuelled, and had 1,900 tonnes of it on board, it could stop at a cold Northern city in December and take on 310,000 tonnes of boria. 100 kilotonnes is only 31 percent the tonnage it can carry. Why wouldn't it load all the way up? Because then it would need 2.22 sister boats to help it bring all the boria back. Or let 69 percent of it not return, but that would be very uneconomic. Next run after that, eleven vessels. At some point, to stay on top of the job, every carrier must take away only as much boron as it will be able to bring back. Taking this light load back to the Northern city it would burn only 1,700 tonnes. Retaining 1,900 tonnes for its next trip South, it would deliver 96,400 tonnes. Don't Oil Tankers Beat 96.4 Percent? Yes. Travelling the same 10,000 km an oil tanker as big and efficient as the ship discussed above would take no payload to an oil well and bring 2.5 times more energy away. Since its propulsion energy use would be the same, its energy transfer efficiency is 98.5 percent, not 96.4. Trying for lower loss in long-range chemical power transmission than boron can give one finds the loss fraction resisting like a live thing, surreptitiously reappearing in other forms, often much bigger than before. Even though the petroleum scheme is in large scale practice, this doesn't mean no such problems can be identified. Some are mentioned below. Unlike oil, it can't even lie there. The particular variety of harm associated with oil and oceans is the oil slick. There never will be a boron slick, nor a boria one. If spilled they both would lie inert on the bottom. Boria would dissolve slowly. The existence of thousands of cubic miles of boric acid already in the sea suggests no harm would come of this . Boron wouldn't dissolve at all. Boron's transport in place of petroleum will yield a very substantial one. Hydrocarbon tanker ships haven't been free of cargo-fed fires and explosions, e.g. the Betelgeuse at Bantry Bay in 1979, and ships carrying boron will be. The difficulty of setting boron on fire is elaborated on in Boron the Unignitable. Briefly stated, you can't light the stuff with a blowtorch. This is a difficulty only in those few centimetres of a boron atom's round trip that lie within a combustion chamber. Everywhere else it's a powerful advantage. A sustainable 31 percent boron load has only 40 percent the energy of a full oil load. So if a ship can be assigned to move one of either load each month, it will be hugely more productive with oil. But some oil well operators in recent years have adopted a practice of gradually increasing the time a ship must wait to get filled. In theory this trend will continue . When this delay raises the round trip time on an oil run to 2.5 times what it is on a boron run, it will no longer make sense to stop at the oil well. Maybe before if the other problems are counted. Why Would the Solar Plant Not Just Make Oil? Or maybe not exactly oil, but a solid hydrocarbon polymer that would combine boron-like ignition resistance and harmlessness if spilled with oil's advantage of 98.5 percent transmission efficiency over 10,000 km. Perhaps this will happen to some extent, but the carrier isn't bringing the necessary carbon dioxide. If it were, it could only take away a 32 percent load of plastic fuel, more than boron's 31 percent but not enough more to compensate for the lower energy content. So like any returning hydrocarbon carrier, it has no payload. The solar plant must be getting its carbon dioxide locally. The world is full of limestone, so that's certainly possible. But carbon dioxide from limestone has an energy cost that is not compensated by any energy yield at the consuming end. Instead that energy would come out near the plant, when dispersed quicklime would take carbon dioxide out of the local air, making the scheme carbon neutral overall. This cost is like a transmission loss of roughly seven percent except it doesn't vary with distance. Where the boron carrier transmits 96.4 percent over 10,000 km, the sustainable hydrocarbon carrier transmits 98.5 percent of 93 percent, result, 92 percent. As is true for most if not all boron substitutes, this one requires a bigger solar plant at the Equator than boron would to support a given load in the world's Northern parts. Hydrogen as fuel is lighter than petroleum, lighter even than boron, and has a nonreturning oxide. Water vapour can be dumped anywhere and hydrogen generating plants can find new water to split, or at least different water, almost anywhere. Hydrogen isn't explosion-proof like boron, but it must beat hydrocarbons and boron in the efficiency race, must it not? Actually it comes dead last. Liquefaction energy is the culprit, and it's not a seven percent loss, it's about half. A boron carrier could go around the world the long way and still beat a hydrogen carrier. So could a carrier of plastic made from air, water, and solar energy. Below are footnotes that are linked to by preceding sections. The main introduction is above, as is the title screen. readers since 14 May 1999 according to the free Web-Counter. The very large volume for ash from liquid hydrocarbon, over 100 cubic metres, is mostly due to gaseous carbon dioxide. The calculation is based on its density at zero Celsius, 0.001977 kg/L. If the problem of where hydrocarbon for many billions of cars will come from in the first place is solved, the release by those cars of many billions of tonnes of this gas presents another difficulty. It seems likely to have global consequences. But its release has immediate local consequences that we seldom think about. We are very accustomed to hydrocarbon-derived limits on our thinking about cars, limits that hydrogen- or boron-burning cars do not impose. (Other limits still exist, of which more will be said a little later.) What if everyone in a crowded shopping mall remained in his or her car? Not as many people could fit, evidently, but maybe these are very small cars. If they burn boron they don't pollute the indoor environment at all. If they burn pure hydrogen the mall's air conditioning may need to dehumidify the air. This situation doesn't arise with today's carbon-burning cars because everyone in the mall would get very short of breath, and flee or die of suffocation, long before anyone would be bothered by humidity. This is true regardless of how well tuned and clean burning the hydrocarbon cars are, because carbon dioxide is the cause of the trouble. This chemical is also naturally produced by human life processes, and we absolutely need to get rid of it. If there is too much in the air, so that blood carbon dioxide has no concentration downgrade to escape along, it doesn't matter how much oxygen there is. If a hydrocarbon combustor in perfect working order, that just means all of the carbon it is exhausting is in the form of dioxide. Malfunctioning cars can emit carbon monoxide, a strong poison, but that is not the main reason why today's cars can't come in the house. If they could, would that a good thing? Difficult to say, what with thinking limited by existing structures, but if we try it for 20 years or so and then consider going back, maybe some benefits will come to mind, or indeed maybe no benefit will have turned up and the cars, after a brief foray, will have returned to their almost exclusively outdoor habits. If one tries to keep a submarine warm with a charcoal fire, and the carbon dioxide that would otherwise be an immediate hazard is made harmless by being captured in alkali, eventually there will be a shortage of oxygen. This is the above mentioned limit that exists even when combustion is carbon free. Infringing on it is dangerous because animals don't naturally detect oxygen-deficient air the way they do carbon dioxide excess. This hazard is a remote one because consuming all or most of the oxygen in an enclosed space produces a huge amount of heat, and it would be very unusual for the enclosure to be able to lose the heat without also exchanging the oxygen-depleted air for fresh. E.g. consider a house trailer sized room 2.5 metres by three metres by five metres. It contains 45 kilograms of air and 10 kg oxygen at sea level. In the depth of winter someone is heating it from inside by burning a carbon-free fuel, and the outside is so cold and the trailer is so thermally leaky that it takes 10 kW of heat to keep it warm. The trailer's occupant gets 17.87 megajoules per kilogram of oxygen if he combines it with hydrogen, so a hydrogen burner will take half the oxygen in 2.5 hours. The unlikely thing, unless the trailer really is hitched to a submarine, is that it could leak all that heat without being well ventilated. In fact this trailer would be unsafe in the summer too, because just breathing in it would raise the carbon dioxide concentration from 0.03 percent to 0.2 percent in 2.5 hours. When oxygen is combined with boron the heat yield per kilogram of oxygen is 26.53 MJ so in that case, for a 50 percent depletion to exist, the trailer must still be on the same air after 3.7 hours. An Oxygen Extractor that Quits before You Do? It's possible that boron's unignitable nature will make a total difference, and make that slight extra time irrelevant. While hydrogen can be ignited very easily, even in air with low oxygen, a designed system is needed to ignite boron. Part of the necessary commitment is extracting pure oxygen from air. Air gives up oxygen not directly to a boron flame, but to an oxygen extractor, and if that device can be so made that it will take plenty of oxygen when there is plenty, and none at all if the oxygen concentration is getting down anywhere near a level that would inconvenience air-breathing life, then dealing with the anoxia hazard will have been folded into a design task that had to be done anyway. Boria is a glass-forming oxide. Tables of physical properties list both a vitreous (glassy) form and a crystalline form that is quite a bit denser and minutely lower in energy. Because of this energy difference, if you burn boron and the ash you get is droplets of the glassy form, your final energy yield is about 99 percent what you would get if it went all the way to crystalline B2O3. Energy yield calculations in this document are based on burning to glass. The one percent is not entirely lost because when the ash gets back to the central power plant for recycling, it still is glassy, and this means the one percent is still in there. So the energy cost of recycling is less. Not a whole percent less though. If boria crystals are heated to 450±2 Celsius they definitely melt. But if the liquid is cooled down through this temperature, it supercools, and if it is taken on down to room temperature, the supercooling is locked in. This is glass. Based on hydrogen density 0.07078 kilograms per litre. This is the density of liquid hydrogen at its normal boiling point, 20.28 K, minus 252.87 Celsius. 3,310 Celsius for methane, 3,370 Celsius for hydrogen. 4,640 K is the adiabatic flame temperature, i.e., the temperature in a flame that has no way to lose heat and therefore is as hot as can be. If heat loss were possible then the molecular fragments shown in the last four lines would sort themselves out into the diboron trioxide and leftover oxygen shown in the first two. This is what is predicted for methane. A solid lump of boron is not a practical fuel configuration, but if it were, it would be four times smaller in volume, a golf ball next to a tennis ball, compared to a hydrocarbon tank to deliver the same energy. Boron's combustion energy density is the highest there is. This is almost true of its atom density also. Among solid forms of pure elements only diamond has more atoms per cubic centimetre, and unlike boron, diamond is stable only under high pressure. Boron's mass density is not exceptional. The beta-rhombohedral crystalline form has density 2.34 kg/L and that is the basis of the energy-specific volume figures used here. WebElements gives a density of 2.46 kg/L but that is the density of alpha-rhombohedral boron. Neither form is quite as dense as aluminum, 2.70 kg/L, but since the average boron atom is only 0.40 as heavy as an aluminum that isn't surprising. When boron is referred to as red, as at http://www.speclab.com/elements/boron.htm, alpha-rhombohedral is the kind being referred to. But boron fibre as it now-a-days comes off the chemical vapour deposition line is beta-rhombohedral and, as shown in the Introduction, dark brown. A crystal the shape of a tank's interior cannot do likewise, but a long filament can. So for the solid substances the theoretical density, 2.34 kg/L in boron's case, was multiplied by two pi over (five root three) to approximate the effective deliverable density from a cylinder partly filled with coiled filament. Two pi over the product of five and root three is near 0.725520. So boron's motor-deliverable density is counted as 1.6977 kg/L. Why two pi over (five root three)? This is the product of three volume fractions. Eight-ninths, if a coil of many concentric cylindrical layers has the innermost layer at one-third the radius of the outermost one. The other ninth is the cylindrical void surrounded by the innermost layer. It might not be a void during the coil's winding, it might be a spool. Pi over root 12. The filament is circular in cross section. If, after the first layer of windings has been wound, each new loop in every subsequent layer is laid into the groove between two adjacent ones in the layer below, then the circular cross-sections will be in a hexagonally close packed array, and fill pi over root 12 of the cross section plane. That is near 0.906900. The three-cornered spaces between the fibres take up the other 0.093100. Nine over ten. The fibre itself is counted as being only 90 percent as dense as a perfect crystal. Evidently this is a reasonable fuel form but not the only reasonable one, so the exact fraction in a given implementation could be different, maybe better. The same density reduction, i.e. 1.38-fold volume increase, was applied to all the solid fuels. Solid ashes were considered as being made into round rods of as much density as might readily be obtained on a vehicle. For crystalline oxides, this was two-thirds of the X-ray crystalline densities tabulated under "X-Ray Crystallographic Data of Minerals", p. B-186, CRC Handbook of Chemistry and Physics, 60th edition, CRC Press 1980. This table did not provide data for lithia or phosphorus (V) oxide, so its entry in "Physical Constants of Inorganic Compounds", p. B-92, was used. Only one listed oxide, boria, is purely unable to crystallize when rapidly condensed from a flame. (Or maybe two, but silica was treated as condensing to nanocrystalline quartz.) Boria was counted as forming round glass rods of density 1.812 kg/L. This is 71 percent, not two-thirds, of its WebElements crystalline density in stablest form. These reduced densities were further multiplied by the packing fraction of round rods that are as long as their container: pi over root 12, near 0.9069. Pulling thread off a skein and forcing it into a pressurized chamber may seem like pushing a rope uphill. However in a heat engine there will be cool working fluid being forced into this chamber, and if the channels it enters by surround the thread's entry path, and it flows faster than the thread, it can drag the thread in. Or at least, that's one method that logically ought to work. The task of pulling the thread up the pressure gradient turns out to be very small in terms of energy requirement, because the volume per unit time of thread that must enter the chamber is small, because boron has a high energy density. Now if the pressure in the chamber is 100 bars, 10 megapascals (MPa), and outside is one bar, 100 kilopascals, then the rate of addition of pressure-volume energy in the thread is 0.000000137 m³/s times 9,900,000 pascals, and that is 1.35 watts. In a perfectly efficient system that would also be the required power. Since several kilowatts of the 16.7 kW (thermal) will become mechanical power that can be tapped for this, even with some losses it will still be a small fraction of output. Condensing and storing 237 litres of water over a 1,000 km trip could be a real awkwardness for hydrogen-powered vehicles. But despite the scoffing of men in the street, experts have concluded that just letting it go, as vapour, is a pretty good solution. In fact it is what already happens to water from hydrocarbon combustion. Hydrocarbon combustion produces less water, only 93 litres (as liquid) in this case, but even so, the Earth annually gains a cubic kilometre of water this way, enough to raise sea level by a tiny fraction of a millimetre. Based on the density from CRC tables of the glassy form of the oxide, 1.812 kilograms per litre. This is the only form of boria that matters in the context of using boron and boria as, respectively, energy supply and demand carriers. At room temperature and pressure the stablest form of boria is a crystalline one with a density of 2.46 kg/L (CRC60, p. B-62) or 2.55 kg/L (WebElements). Despite its stability it is hard to make. Another, still denser crystalline form that is not stable is reported in the Kirk-Othmer article. It's interesting to consider that if it were absolutely required, a gasoline-powered car could retain its carbon dioxide. There would have to be a large heat exchanger ("radiator") to get nearly all the combustion heat out of it, and a sturdy pressure tank. One pound of octane gives 3.08208 pounds of carbon dioxide. In the 1,000-kilometre example, 65.7 kg fuel gives 202.5 kg carbon dioxide. On a hot day (30 Celsius) this can be kept liquid by a pressure of 7.164 megapascals, just over a thousand psi, and its volume then is 338 litres, 3.7 times the original fuel volume. Gasoline has various reported densities ranging from 0.695 kg/L to 0.75 kg/L. Its lower free energy yield, which is the yield if the water is produced as vapour, is between 44 and 46 megajoules per kilogram. For the eight-carbon alkane known formally as 3-ethyl-3-methylpentane the data are 0.7274 kg/L and 45.66 MJ/kg. Since these are precisely known and fairly well centred in gasoline's range of variation this octane was taken as a fair representative of the whole commodity. As a basis for comparison, the energy to propel a car 1,000 km at 125 km/hr is set at an arbitrary round value of 3.00 billion joules in this table. If the joules are from gasoline, the car is getting 26 miles per US gallon. Actually 150 litres is less than a quarter the bulk of a three-gigajoule, thousand car kilometre liquid hydrogen tank. 373.8 litres is the volume of the liquid hydrogen itself, but that is only the start. The vessel around it roughly doubles the volume and triples the mass. The volume of a hydrogen tank must include some wall thickness to keep the rate of inward heat leakage low. Too many watts coming in means not only rapid loss of fuel to evaporation but a hot catalytic oxidizer at the end of the relief line. At least one would hope it means that. This is an aspect of automotive hydrogen tank design rarely discussed but a catalytic oxidizer seems like an obvious and necessary part of it. A 373.8-litre volume, if spherical, is 0.8937 metres in diameter. That is the inner diameter of a spherical hydrogen tank for a 1,000-kilometre-range car. Suppose the walls are 0.1 metres thick. Their volume then adds another 311 litres, because the volume of a sphere 1.0937 metres in diameter is 685 litres. What are those walls made of? Layers of vacuum alternating with thermal radiation barrier layers, preferably reflective. There must be structural strength to support atmospheric pressure from outside, plus strength to resist whatever pressure the hydrogen inside is allowed to exert before it begins to exit the relief valve. This is not necessarily a difficult structural problem, not unless it also is demanded that average density of the tank wall not greatly exceed liquid hydrogen's. If in fact the wall averages a balsa wood-like 0.2 kg/L then the tank, to contain 26.5 kg hydrogen, must on its own mass 62 kg. This is why the apparently very small mass of the hydrogen ends up being part of a massive system. (Still more so for metal hydrides.) In fact with the above estimates it seems a 1,000-kilometre hydrogen tank masses 88 kg full, more than either a gasoline tank or a spool of boron. The forms natural boria is found in are borates, combinations with other oxides, e.g. borax Na2B4O7·10H2O. Dissolved oxidized boron is vital to plants including trees, and they contain quite a few parts per million of it, so if you burn them, you are going to get volatilized borates. It seems possible that despite boron's not being a household word, the smell of borate is an essential part of the smell of wood smoke, and as such has been part of human experience for many thousands of generations. Economic borate deposits are rare, occurring in arid regions of Turkey, the USA, Argentina, Chile, Russia, China, and Peru. Total world production of boron minerals ... was approximately 2 750 000 tonnes in 1994. About 800 000 tonnes of commercial borate products, expressed as B2O3, were manufactured from the boron minerals. ... General Electric Company undertook a research and development program in Malta, N.Y., which actually made commercial quantities, several hundred pounds of diborane, pentaborane and decaborane. These more stable boron hydrides are the contributions of Alfred Stock. All went well until about 1948, when the plant was cleaned and washed out with carbon tetrachloride, not realizing that carbon tetrachloride and decaborane form an explosive mixture equivalent to nitroglycerin. The plant was blown away. So, live and learn. Anton Berg at USC had warned them that this might happen. They did it nonetheless. Several hundred pounds is enough for one rather small rocket. Possibly "tons" is what was meant. Note the one extra word, hot concentrated nitric acid. Both sources agree that the boron must be in very small pieces, so that it has a lot of surface area. This may not apply to the reaction with fluorine, because boron trifluoride is gaseous and does not seal off a boron surface the way the oxide does. Neither elemental fluorine nor hot conc. nitric acid are ever found in Nature. Therefore artifacts of massive elemental boron left outside will last a very long time. This inertness suggests that at normal environmental temperatures, unlike aluminum, boron does not have the oxide coat that prevents it from catching fire when hot. At room temperature naked aluminum reacts instantly with air or water. This can be confirmed by filing aluminum under water. 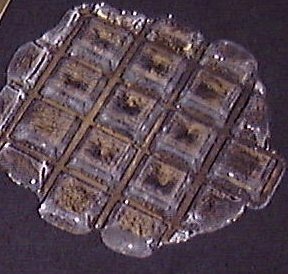 The newly exposed metallic surface takes oxygen and leaves hydrogen, which appears as minute bubbles. But while aluminum is metallic, boron is not. Like graphite it may have just a layer of adsorbed air. Supporting this notion is the fact that lumps of glassy boria start out as transparent as ordinary soda lime glass but quickly acquire a milky appearance through the growth of a thin superficial layer of boric acid. Boric acid dissolves in water, so if boron grew a coat of oxide at normal temperatures, water could attack it in two steps, and it would not be as inert as it is. Helium as working fluid in a heat engine has very simple behaviour. Its heat capacity is always the same, it always is a gas and never changes state, and it doesn't react with anything. But however pleasant it might be in car motors it can't reasonably be expected to be available for them and is mentioned here only as a simple example. Flowing along a turbine blade is something boria can do and other oxides with high specific binding energies cannot. Boria condenses at a very high temperature, well above 2,000 Celsius, but remains able to flow down to much more moderate temperatures. Here is a rough calculation showing that even though liquid boria has very high viscosity, centrifugal force in a turbine motor is abundantly strong enough to move it. Viscosity and density data are from "Boron Oxides, Boric Acid, and Borates", Kirk-Othmer Encylopedia of Chemical Technology, 4th edition. If we have a tension ring-supported turbine blade turning 500 times per second whose inner tip is at radius 0.02 m, angular speed being 3,142 Hz, the tip's centripetal acceleration is 197,000 m/s². If adequate flow exists here it will also exist farther out where the acceleration is greater. Suppose the boria coating is 100 microns thick, and its temperature is 1,000 Celsius. What shear rate must exist right next to the blade? At 1,000 Celsius boria's density is 1.523 kg/L so in the centrifugal 'g' field it weighs 300.0 kN/L. 300 million newtons per cubic metre. Times the supposed 100-micron layer thickness gives the shear stress, 30 kPa. Viscosity is 7.4 Pa·s, seven thousand times the viscosity of water at room temperature. Ten microns out from the blade, if that speed gradient were constant (it isn't), the fluid would be flowing 0.010 m/s. The layer is 100 microns thick so the average speed in this instance is 0.135 m/s. Since all this is happening 0.02 m from the turbine axis, the area of the outward-flowing film is 100 microns times the circumference, at that radius, of all the turbine blades. Suppose their circumferences sum to just twice the circumference of the 2 cm-radius circle. That makes 0.25 m. The total stream area then is 0.000025 m². This times the speed, 0.135 m/s, makes a flow of 0.0000034 cubic metres per second. 3.4 cubic centimetres per second. This represents 88 kilowatts of boron combustion thermal power, enough to keep a large car moving quickly, and 100 microns is not a very thick coating. Therefore, Q.E.D., the oxide flow is sufficient. Compare silicon dioxide, the other one of the big two glass-forming oxides. At 1,500 Celsius vitreous silica still is more than a billion times as viscous as water. Its metastable liquid state becomes absolutely stable — the crystalline form melts — at 1,723 Celsius rather than 450 Celsius. Getting liquid silicon dioxide to flow along a turbine blade would require that blade to be well above 1,723 Celsius. What about non-glass-forming strongly bound oxides? Their tendency, once they have condensed from their formative flame as liquid, is to freeze to crystals at a temperature not much less. E.g. aluminum oxide, which condenses at around 3,000 Celsius, roughly a kilokelvin higher than boria, and freezes hard at 2,054 Celsius (WebElements), 1,600 K higher than boria's theoretical freezing point. Once an aluminum flame was diluted with working fluid down to a temperature a turbine blade could take, it would be a suspension of corundum crystals, not droplets. These would not stick to the turbine blade surface and run out along it. Rather, each one would take a little bite and soon the blade would be a stump. Methanol, also known as wood alcohol, is included at the suggestion of a reader. It burns cleanly, yielding, per thousand car kilometres, 192.7 kg carbon dioxide. Compare the 202.5 kg produced by equivalent 3-ethyl-3-methylpentane. Methanol's mass density is 0.7914 kg/L as liquid at 20 Celsius. Its specific energy is 21.38 MJ/kg and therefore its energy density is 16.92 MJ/L. This means 1.96 times as much volume as equivalent 3-ethyl-3-methylpentane. Not as bad as hydrogen, which has 4.14 times the volume of the hydrocarbon. But while a hydrogen vehicle's fuel reservoir system is more massive and much more complex than a gasoline tank, in part because of hydrogen's superlative bulk, the intrinsic mass of the absolute actual basic hydrogen is superlatively low. Methanol does not have this virtue-in-principle. It is not only almost twice as bulky as gasoline, it is heavier by a factor exceeding two. 0.014 kg/s divided by density, 2.11 kg/L, means the volume of thread pulled in in one second is 0.0066 litres. If the thread is 0.1 mm in diameter, the length that has that volume is 834 metres. Thicker filament evidently is necessary, or multiple strands. A single strand at 0.5 mm diameter will bring in the right amount of boron if its speed is 33.4 m/s. The liquid boria has precipitated out of the working fluid, and is not changing in volume like the working fluid, so it isn't cooling itself directly by that mechanism. It may still be in contact with the fluid. The fluid is going down the centre of the expansion channel, pushing on turbine blades, and the boria is running along the channel walls. What if the contact isn't enough, and the oxide just stays hot? Interestingly this doesn't mean major inefficiency. When the hot gaseous oxide in the flame mixed with, and condensed in the working fluid, it transferred something like 97 percent of the combustion energy. What's still in the liquid oxide is comparatively tiny. As noted in section Boron of the Bright Flame, boria newly formed in a boron-oxygen flame can start out at or above 4,600 K. Elsewhere we have considered a muscle-car case where at certain times 800 kilowatts of heat are needed in the combustion chamber. What kind of flame can broadcast this much power? Actually only two-thirds of the power can move this way. The other third comes from the heat of condensation of boria to liquid, which occurs at a temperature — mid-2,000s Kelvin — that might in some circles be considered warm, but is far too cold for radiation heat transfer. The flame and the other fluid must mix for this final transfer to happen. The minor radius 'r' comes out to be 18.7 millimetres. This suggests a boron-oxygen flame 262 mm in length (twice seven times 'r') and 38 mm wide could radiate the required thermal power. This will readily fit in a combustion chamber 400 mm long, and so seems not out of line for a car. Might an oxygen purifier / inert gas excluder also be good for a motor burning something else? It depends on the separability of the ash, and that in turn is associated with density. Boria is very separable from oxygen because it is very much denser, and it is denser because it liquefies. If it remained gaseous it would be only a little denser, not enough to separate. A hydrogen combustion motor could conceivably have hydrogen for its working fluid, with combustion provided by an inverse flame — a jet of pure oxygen reacting with the hydrogen around it. Since the hydrogen would be in excess, the oxygen would be totally consumed. So indeed, an oxygen purifier might be put to good use here. But only if the water vapour coming off the inverse flame would liquefy, and be separable. Liquefying water in an internal combustion motor is difficult. But if it were done, the departing liquid water would not carry much hydrogen out with it, so little hydrogen and no oxygen would be wasted. Hydrocarbon motors now-a-days depend on nitrogen to be the bulk of their working fluid and to dilute the flame and limit its temperature. This leads to nitrogen oxide formation. Even so, it's hard to see any gain in switching to pure oxygen. Carbon dioxide cannot be liquefied in a motor, so if the motor is burning a lean fuel-oxygen mixture the departing CO2 will sweep excess oxygen out with it, and waste it. If the mixture is fuel-rich the excess fuel will be wasted, and also partly turned to soot. Finally, a balanced (stoichiometric) mixture will burn very hot, and nothing will be present to dilute it. Hydrocarbon motors would really work better on the neon planet. Actually there is a possible diluent for a pure oxygen flame burning nearly stoichiometric hydrocarbon fuel: high-pressure carbon dioxide. The dilution produces a mixture of steam and carbon dioxide. All of the first is fuel ash, as is some of the second. After the mixture has expanded and done some work it can, by cooling, be made to release its water as liquid. Then when it is compressed again a fraction of it equal to the fraction of the carbon dioxide that is newly generated can be liquefied, drained off, and as much carbon dioxide as before can return to the flame. This is discussed as the "semi-closed CO2/O2 Brayton cycle" option in Bolland, O. and Mathieu, P., 1998, "Comparison of Two CO2 Removal Options in Combined Cycle Power Plants", Energy Conversion and Management, 39 (16-18), pp.1653-1663, also available 10 December 2001 as a PDF file at http://www.tev.ntnu.no/Olav.Bolland/flower97%5Cflower97_b.pdf. Some publications on combustion of particulate boron exist but apparently nothing about flames propagating along fibre and consuming it. But much of what will happen can be predicted. 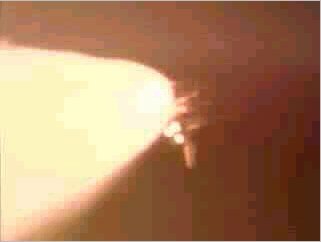 The high pressure flame is very bright and boron is dark, so as the flame gets near a particular small spot on the boron surface, that spot is strongly heated by light from the flame. Being transparent, the oxide coat can't get heat this way but can get it by conduction from the underlying boron — except there now is doubt this coat exists. As the boria gets hotter oxygen is increasingly able to diffuse through it. The oxygen pressure is high on the outer, liquid surface and near zero at the inner solid surface, so the diffusional flow of oxygen is inward. The oxygen pressure at the boron surface is very small because oxygen arriving there is immediately consumed, producing new oxide and much heat. So two mechanisms, flame light absorption and combustion with diffused oxygen, both produce heat right at the boundary between solid boron and liquid oxide. With the approach of the flame, both mechanisms speed up. Soon the oxide at the surface boils. This lifts off the rest of the oxide coat and exposes the hot boron directly to gaseous oxygen. This is where the flame proper begins. Nothing has yet created any heat inside the solid body of fibre. It's dark in there and oxygen can't get in. So the only way heat can get in there is by conduction. This means that even when the naked boron fibre is shrouded in flame, and molten on the surface, it still is solid in the middle. It will continue to advance longitudinally within the flame just as, up until the oxide coat peeled off, it was advancing towards it. With the coat gone, and turbulence caused by vapour expansion, gas rich in oxygen will move across the liquid boron surface, laterally. When the coat was there it sat motionless and oxygen could only diffuse straight in, but now it can blow over the surface like wind blowing over a landscape. As it does so it scours out boron and carries it away as gaseous boria. Something like weather on a micron distance scale, and fractional microsecond time scale, will occur: a surface current that is consuming boron will heat itself and expand. But in expanding it will push itself away from the fibre, and be less dense where still in contact, so its rate of self-heating will be reduced. The heat recently gained will now be radiated away faster than it can be replaced. So the gas current will shrink. This shrinkage will be the more because each two molecules of gaseous ash have replaced three molecules of oxygen. When it shrinks, it will do so around its new centre, which is away from the fibre because it pushed itself away. Other gas will be pulled in between it and the fibre. Each particular surface microgust gets laden with oxide vapour, but overall there is an abundant excess of oxygen, because of the boron motor's ability to retain unconsumed oxygen and bring it around again. So the fibre will be completely consumed and suboxides, such as diboron dioxide OB-BO, will not survive. All this predicts why a flame, once in being, will eat all the fibre that the fibre it is on leads to. In a gas with a high enough pressure of oxygen. But if cold fibre is fed into a chamber with cold oxygen, or even oxygen that is somewhat hot from compression, nothing is going to happen. A likely way around this is initially to heat the oxygen that will be nearest the cold boron filament with an electrical discharge. This discharge will heat the oxygen well above boria's boiling point and stand in momentarily for the flame. Boron has chemical symbol B, carbon C, hydrogen H. These symbols can be seen at WebElements, with links from each to information on that element. The density that site gives for boron, 2.46 kg/L, is that of alpha-rhombohedral crystals, the kind that are densest but not stablest nor easiest to make. Carbon has in diamond a transparent allotrope hard enough to cut every other known substance, including all forms of boron, and in graphite an opaque soft one. One could fairly say boron combines adamantine hardness and brittleness with the grey opacity of graphite. But that's the beta-rhombohedral form. According to F. H. May and V. V. Levasheff's "Boron" article in the 1987 McGraw-Hill Encyclopedia of Science and Technology, crystals that form at or above 1,300 Celsius are of this kind, and the shown filaments therefore are likely to be beta. They were provided by courtesy of Textron Systems. Alpha-rhombohedral boron crystals, which May and Levasheff say form between 800 and 1,100 Celsius, are the form of boron that is red. The colour of single crystals is said to be a beautiful orange-red due to their transparency to light of photon energy below 2 eV. So perhaps this form, if the crystals could grow big, could be the gem variety of boron as diamond is of carbon. These energy yields are more precisely Gibbs free energy changes between the chemicals before and the chemicals after. So are all the chemical energy measurements in this document that don't specifically refer to heat. For each of boron, 3-ethyl-3-methylpentane, etc., the contained energy that it and oxygen together lose when reacted at constant pressure — its enthalpy of combustion, DH, given below — differs by a few percent from the free energy, DG, given in the main text. Exergy measurements show how much energy per unit of fuel is available for conversion to work, without regard to where it originates. A motor that burns complex molecules, e.g. 3-ethyl-3-methylpentane, to simpler and more numerous ones can take some heat from the environment through the dispersal of those waste molecules. This is reflected in the DG/DH ratio column above. With 3-ethyl-3-methylpentane the total energy available for conversion to work is 1.0318 times the combustion enthalpy. No actual cooling of the environment occurs. 3.18 joules are pulled in for conversion, but then, out of 103.18 joules, only 20 to 30 become work. The main effect on the outside world is the immediate addition of 73.18 to 83.18 joules. When a car goes along a level road the 20 J to 30 J of propulsion work also becomes heat again after a very slight delay. All the work the motor does, it does against friction. 100 percent of the (fuel plus oxygen) enthalpy becomes heat in the air near the road, and a relatively tiny amount of preexisting heat that was in that air, and was borrowed, is quickly returned. The ratio column shows boron, aluminum, and hydrogen all behave oppositely to 3-ethyl-3-methylpentane. Rather than having all their combustion enthalpy convertible and borrowing three percent more on top, they lose almost six convertible percent. This is because the products are (in water's case) larger molecules than the reagents, or (in the cases of boria and aluminum oxide) solids. Manageability has its price, and for these ashes it's nine percent. The energy density shown for carbon is based on the mass density of graphite, 2.267 kg/L (WebElements). Diamond is 56 percent denser but that only brings its combustion energy density to 84 MJ/L, not quite as good as beryllium and far short of boron. Diamond is slightly unstable with respect to graphite but this adds less than half a percent to its combustion energy. 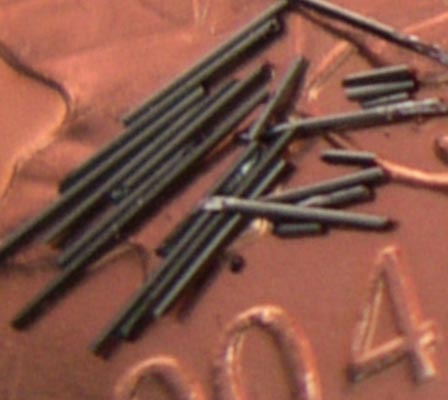 One vendor of pyrolytic boron nitride claims that artifacts of this material "can be exposed to oxygen indefinitely at temperatures up to 750°C", which is a dull red heat. So of course can we; we'd burn. If the implication that boron nitride won't is true, it suggests the nitride also grows a thick, flawless coat of liquid boria. Without that, it would burn very well, because boron nitride is much less stable than the oxide. Also known as magnesia, and when rocks are made of it they are said to be made of the mineral periclase. It is a very stable solid, m.p. 2,852 Celsius. Involatile: having low vapour pressure; tending to remain in a condensed phase, i.e. solid or liquid. The opposite of volatile. Volatile materials have high vapour pressure. If they are combustible, this makes them easier to ignite. Their vapours mix with air or oxygen. "Volatile" sometimes is used as if it meant "easily ignitable" but it strictly doesn't. Things that cannot burn at all can still be volatile, e.g. water and carbon dioxide, the two ashes of hydrocarbon combustion. is given in the 4th edition Kirk-Othmer Encyclopedia of Chemical Technology, in Table 4 of the "Boron oxide and borates" article by Smith, R.A. and McBroom, R.B. 'T' is the absolute temperature and the range of validity is from 1,331 K to 1,808 K, which is 1,058 Celsius to 1,535 Celsius. The upper end of the range is the melting point of iron. 29 Pa is what this equation gives there. This same 29 Pa is the vapour pressure of water at -32 Celsius. People who live with winter know that at -32 Celsius ice sublimes very slowly. However, the rule's output actually makes more sense if "kPa" is taken as a typo for "bar" (1 bar = 100 kPa). So amended, it says at 1,808 K the vapour pressure is 0.0293 bar, the same as that of water at +4 Celsius. This agrees fairly well with the 1873-K 0.05-bar boiling point observed in experiments on the oxidation resistance of the diborides of zirconium and hafnium. The vapour pressure of ice and water is given in a table in the CRC Handbook of Chemistry and Physics, CRC Press, p. D-195 in the 60th edition. Fuel cell researchers Licht, Wu, Yu, and Wang report harvesting the oxidation energy of boron and vanadium simultaneously by making them into zirconia-stabilized VB2 anodes. 21.622 grams of boron and 50.942 grams of vanadium can be oxidized with a delta 'G' of -1914.6 kJ. Combining them as vanadium diboride reduces their subsequent delta 'G' of oxidation by approximately the delta 'H' of that boride-formation, -206 kJ, leaving roughly -1709 kJ. Divided by the total fuel mass and inverted, that works out as 42.47 kg/GJ. On the ash mass chart magnesia is a little lighter than vanadia-plus-boria, 70.84 kg/GJ versus 93.95 kg/GJ. They say VB2's density is 5.10 kg/L. Dividing 42.47 kg/GJ by this yields 8.33 L/GJ, a fuel volume barely exceeding that of boron itself. Inverted, it is 0.120 GJ/L. However, they say their anodes have a volumetric energy capacity of 0.097 GJ/L. Perhaps some of the energy is being spent getting the electrons through the stabilizing zirconia coating. Ideally the energy-specific volume of the ash mixture would be (38.42 mL (B2O3) + 27.15 mL (V2O5)), all over 0.001709 GJ. That is 38.37 L/GJ, a little better than ZnO. A VB2 combustion system could approach this compactness. However, in this case as with zinc, an air-breathing fuel cell that oxidizes metal fuel produces the metal oxide as a mixture of small particles with the caustic electrolyte solution, and this sludge is not so compact. In descending order of combustion energy density solid boron, beryllium, aluminum, carbon, and silicon all have more of it than 3-ethyl-3-methylpentane. That is not an exhaustive list. As seen in the kilograms per gigajoule chart the show there is really over once the atomic number reaches six, but that isn't true for energy density. Some quite heavy elements that would never make sense as motor fuel, e.g. zirconium, nonetheless have denser combustion energy than liquid hydrocarbons. So what has made boron, etc., unthinkable as alternative fuels? Perhaps it has been an unstated assumption that pure oxygen could not be supplied to a vehicular combustion chamber. When this is done, complete retention of solid or liquid ashes is possible, and fuels that produce them can be considered. But if other gases besides oxygen are let in, they must be let out again still in gaseous form, and some fraction of a solid or liquid ash stream would escape with them. As discussed in Internal Boron Combustion Engine Considerations, this can be avoided with pure oxygen because all of it can be incorporated in the ash. Incidentally the second quote refers to a remarkable investigation where a vehicle, instead of carrying around something that can burn and be the hot end of a heat engine, carries around liquid nitrogen for the cold end. All of the heat that gets converted to propulsion energy starts out in the air around the vehicle. In very favorable conditions the system may, per kilogram of liquid nitrogen consumed, convert as much as 0.4 MJ of environmental heat to propulsion energy. This, and liquid nitrogen's 0.8081 kg/L density, make 57 gallons of liquid nitrogen yield less propulsion than 2.8 gallons of gasoline, and less than one gallon of boron. This is an extreme example. Most alternative fuels don't fall this far short. Boria dissolves slowly as boric acid, and much of the world's boron is already in the sea in this form. The boron concentration is variously reported as 4.4 and 4.6 parts per million by mass. Most of the mass of boric acid is hydrogen and oxygen so 4.6 ppm B translates into 26 ppm boric acid. In the whole ocean this means roughly 30 trillion tonnes of it. A few hundred kilotonnes of scattered boria lumps on the sea bottom would, if washed over by a bottom current, have a plume of elevated boric acid concentration downstream of them, but because the process of dissolving is slow, the elevation would be slight, i.e., the concentration would not be much above the natural level. Boron will be sent forth to be fuel again ... and again, and again, and again. Boron can't get bored. What about the oxygen a deoxidation plant separates from boron? Will it just be let go? Yes. There is some call for pure oxygen, but not conceivably enough for the huge volumes boron deoxidation will make. The most notable demanders of pure oxygen are the very combustors that the boron will burn in. Since the same boron is used over and over again, it might seem the same oxygen could also be reused, and the combustors could be spared the work of isolating new oxygen from the local air. But what with oxygen's being a gas that if kept would have to be kept in something, and the hazardous nature of compressed or liquid oxygen, and the large amount involved — 2.22 kg for each kilogram of boron — new oxygen turns out to be a lot less trouble. The best thing to do with the oxygen, really the only thing, is store it in the Earth's atmosphere. Other names include boron oxide and boric oxide and anhydrous boric acid (or boric anhydride). Analogy with silicon dioxide, silica, suggests diboron trioxide should be called bora. This was proposed in 1931 by S.R. Scholes but did not catch on. Four letters may be just too few. Calcining limestone makes gas where there was none. If limestone were heated in a sealed vessel and the carbon dioxide could escape only by turning a dynamo, the resulting electricity could heat a resistor in the vessel. This could provide a fraction of the heat. But since the DG° measure measures free energy, not just heat, it already takes this potential efficiency pretty well into account. "Boron", P. A. Lyday, USGS 2000 (http://minerals.usgs.gov/minerals/pubs/commodity/boron/120498.pdf). There are a number of university extension service documents on boron supplementation for crops, including one from Michigan State University. 3,600 megajoules, one megawatt-hour, is the amount of chemical energy in 29 US gallons of gasoline. That would mass 174 pounds, plus the mass of a container. The same in boron would mass only 145 pounds, and unlike gasoline, boron is safe to touch and won't flow, so a strong SUV driver could bring a megawatt-hour on board by lifting just that much. But the largest 2000-model SUVs can take on fuel containing 1.4 to 1.5 megawatt-hours. Even in boron this would be an impossible lift for just about anyone. Presumably this will let future SUBV operators off the hook. They can divide a boron reload into several handy 60 lb aliquots. More data on fuel mass-to-energy ratios are given in section Boron the Energetic, allowing, for instance, calculation of how massive a megawatt-hour in silicon would be: 3.6 GJ * 32.79 kg/GJ = 118 kg, 260 lb. At 10 Celsius. Room temperature operation would be slightly less efficient. The researcher is Hiroyuke Nishide, Waseda University Professor of Macromolecular Chemistry (http://www.appchem.waseda.ac.jp/fm-eng/nishid-e.htm). Industrial sturdiness is the presumed explanation for the three-tonne mass of the OXP-30 separator from Oxair. No particular endorsement of this product or slight against unmentioned competitors is intended. The "30" is the number of kilowatts of compressor power the device requires. It purifies a little over 11.4 grams per second of oxygen, and at 30 percent efficiency, that can support 45 kilowatts of hydrocarbon power, 84 kW of boron power. 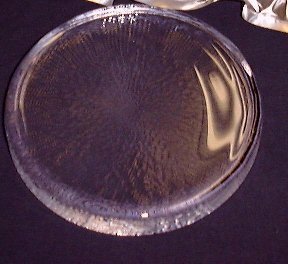 The boria disk actually is meant to be melted and used as a transparent inert high-temperature bath — a "liquid encapsulant" — within whose protection crystals of certain semiconducting compounds can grow. It probably would break if thrown onto a hard surface, but glass breaks because it is very notch-sensitive, and a very recently cooled glass form, whose surface has not yet had any microscopic notches worn in it, can be amazingly tough. In any case the ingot wouldn't remain shiny and transparent. Atmospheric water vapour would make its surface opalescent with a very thin, slippery tarnish of boric acid. Where an athlete touched this solid acid her sweat would dissolve it, producing a solution that is harmless to human skin, but corrosive to boria glass. White, flaky handprints would form. As a combustion fuel boron is favoured over hydrocarbons in use today on several performance measures. Most of them favour beryllium even more. So why not beryllium? A very small fraction of the very small beryllium fraction in the Earth's crust occurs as the mineral bromellite, which is beryllia. Although very toxic if pulverized or dissolved, bromellite dissolves less in water than does aluminum oxide (mineral names corundum, ruby, sapphire), melts higher (2,507 Celsius according to WebElements), and is at least as hard. So it presents little natural hazard. If there were cars that ran by oxidizing metallic beryllium, they could hardly produce the oxide in any other form than very fine powder. One might envision a variation of the Verneuil synthetic ruby-growing technique where beryllia replaces alumina and is born in the flame, not just melted there, but the boule would have to, and this is the impossible part, capture all the beryllia. Any that was still suspended in the gas downstream of the boule would tend to destroy both engine parts and people investigating why the engine had failed. To work as an energy carrier, an atom of either of these rare elements can't be oxidized once and discarded, like an atom in petroleum. Instead, like a cell in a very durable rechargeable battery, it must be kept and recharged. Since a gigajoule will propel a car approximately 300 km, the raw material cost of a boron/boria battery big enough for a car (including enough cells on board for several hundred kilometres' range, some at a power station being recharged, and some in transit to and from there) would add at most a few percent to the total. A similarly spread-out beryllium/bromellite battery would cost more than most cars. If there were a magical way to cancel either beryllium's prohibitive toxicity or its very high cost, but not both, its use as an energy carrier would remain unlikely. If "ash" is (as noted in the main text) reasonably defined, adding per-joule fuel masses and oxygen masses will give a very good approximation of per-joule ash masses. But the same sum answers other questions, such as what mass of (fuel plus oxygen) must be on board a rocket in order for its motors to have a joule to work with. Like a rocket, a lead-acid battery is not an air-breathing device. All the atoms it will get energy from are already inside it. It may therefore be fair to include in an air-breathing system's mass not just onboard fuel but atmospheric oxygen, especially if that oxygen spends some of its time on board too, as it does in boria awaiting recycling. If producing electricity is the goal, the battery's ability to do it directly while combustion energy must go through a heat engine and then a dynamo means the (fuel plus oxygen) mass might fairly be multiplied by three. The heat engine and dynamo together may not reach 33.3 percent efficiency, but neither will the battery reach 100 percent. The result for (boron plus oxygen) is 177 kg per electrical gigajoule. When they are young and frisky, fully charged lead-acid batteries mass about 7.5 tonnes per electrical gigajoule. Zinc has been recommended as an energy carrier on the grounds that it has a high energy density and can readily be oxidized in a fuel cell with room-temperature aqueous potassium hydroxide electrolyte. A heat engine burning zinc or a fuel cell oxidizing it would take just 50 kg of oxygen from the surrounding air per gigajoule of released energy — less oxygen than hydrocarbons take. That is zinc's best showing in the basic fuel performance charts. The two where it shows worst are fuel mass and ash mass. On the ash volume chart the story is not so simple. Zinc oxide is solid, worth US$1 a kilogram (Table 16, J. Plachy, USGS 1999 (PDF)). Like boria it is therefore potentially a zero-emission ash: easy to hold onto, and worth holding onto. Its holding bin would be bigger than for any other solid ash listed, but if cars that run on liquid hydrocarbons had ash tanks, those tanks would in turn be much bigger than a zinc oxide reservoir. Section Boron the Dense's data support the claim of high energy density: where a gigajoule in 3-ethyl-3-methylpentane occupies 30 litres, in a 200-kg piece of solid metallic zinc it would just about fill up 29 litres. Heavy though it is, clean dry zinc oxide would not be too heavy to ship hundreds of kilometres to a power station, and bring back as zinc. The energy consumed in transport would be small compared to the energy the zinc would deliver. This can be estimated by multiplying by four the small losses calculated for ocean-spanning energy transfer using boria and boron in section Boron the Wieldy. Such a power station might reduce zinc oxide by non-electrical means (cf. the boria reduction proposed in Boron Decombustion, cf. also, with a grain of salt for the claimed efficiency, http://solar.web.psi.ch/daten/projekt/zno/roca/roca.html), and would need no electrical distribution grid connection. But if the station is so connected, and the grid also reaches conveniently near to where a zinc fuel cell is, its zinc oxide can be electrolysed back to zinc without making a long journey, and without being removed from the electrolyte it was born in. It might seem that an electrically recharged zinc oxidation cell is just a secondary battery, not a fuel cell, but in the plan Metallic Power Inc. says it is putting into effect, a dozen secondary batteries might be divided in 13 parts: 12 travelling fuel cells and one stay-at-home electrolyser. This makes electricity the actual long-distance energy carrier, but as far as the cartridges that shuttle zinc and zinc oxide between fuel cell and electrolyser travel, so far does zinc carry energy. Interestingly, as long as the number of cars powered by zinc fuel cells stays under a thousand, the zinc oxide in their ash reservoirs will actually be more valuable than energetically equivalent boria, despite boron's accurate reputation as a rarer element than zinc. The boria is twice as costly per unit mass, but less than a quarter as massive. Most present-day traffic in zinc is in the elemental form, not the oxide. With boron it's the other way around. Supplying elemental boron for many thousands of boron cars will require new deoxidation plants. But the large existing market for boria will easily be able to accommodate those B car operators who want to sell the used B atoms back. Contrastingly, if there came to be thousands of zinc fuel cell motorists, and they wanted to sell the quarter-tonne loads of zinc oxide that each would frequently possess, the price such a load would fetch would diminish, perhaps below zero. The alert reader may be saying, "Why not just have a 108-litre boria chamber? When a vehicle has been freshly loaded with 32 litres of boron, the 108 litres of boria don't yet exist. By the time they do, the boron won't. They could time-share." This might be workable if boron pellets could be taken from the bottom of the chamber and slabs of boron oxide put in at the top. The glassy oxide is less dense than the pure element, so would tend mostly to stay on top, and could easily be cast in pieces too large to traverse whatever narrow exit channel the boron pellets are taking. But there would have to be other benefits, beyond just reducing the system from 140 L internal volume in two chambers to 108 L in one, and there seem to be negative benefits in this scheme, such as the operator's having to know not to fill the chamber to the top with boron, and the difficulty of shepherding hard pellets from the bottom of a deep layer of them, a few at a time. Contrastingly, there might be positive ones in having the boria in its own space. Retaining these glassy lumps (photo of one commercially prepared for another purpose here) is primarily an economic necessity, not a safety-related one. Spilling them on a road in an accident would not be catastrophic; they'd just have to be picked up. That means boria bins in a vehicle would not need to be in the protected inner regions that gasoline or hydrogen tanks need, and compete with passengers and cargo for. They could be out at the edges, where space is much less scarce. Rather than needing collision protection, they might even help to provide it, although of course they'd be empty just after refuelling. Interestingly, boron itself offers a similar locational flexibility. One could not put a hydrogen or hydrocarbon tank right next to the engine, lest it get heated and build up excessive pressure. But there's no harm if a bin full of boron bits gets warm. Boron's room-temperature inertness to water, and the fact that boron oxide reacts with water and the product, boric acid, dissolves in it, are evidence that there is no room-temperature oxide film. If it existed it would not be protective the way insoluble alumina is protective to aluminum. In "Phase Changes in Boron Ignition and Combustion" E. L. Dreizin, D.G. Keil, W. Felder, and E. P. Vicenzi review recent evidence that this film never turns up at any temperature. They report experiments where electrically heated boron filament would absorb oxygen but not burn even if held in air at a temperature of bright orange incandescence. A little hotter and it would seem to react suddenly with that oxygen, and burn with more from the air around it. This is a sample footnote. You can return to where you were by clicking on the above link, or, with most Windows web browsers, by holding down the Alt key and pressing the left arrow key. Boron: A Better Energy Carrier than Hydrogen? was previewed in Verdana 11 screen font using Netscape 4.7, 16-bit colour, screen resolution 800 by 600. It is meant to be read with a web browser, on a screen. Once the browser has all of it, it will let you know in some way. Possibly a small "Document: Done" will appear on the bottom line of your screen, or a turning Earth at the top right will stop turning. Browsers vary. You can then disconnect from the internet and read without consuming your connection time. Links that look like this — — are all internal links from the main text to a footnote or back. The internet connection need not be on, because the footnote is on the same page already loaded. You are welcome to print a personal copy on paper, but paper does not support internal links. Plus there has been one complaint that it takes a lot of paper, and some of the pages are mostly white. If the copy you are looking at has a screen-top ad banner and you want to get rid of it, try http://www.eagle.ca/~gcowan/boron_blast.html. Is This in Any Way New? Yes. Although decades ago programs to use boron as motor fuel began and ended, the method of burning pure solid boron is very different from those programs and treats things that made trouble for them as opportunities. Shortly after the second world war much work was done in the U.S.A. to put boron to work as a military jet fuel by making liquid compounds of it. These compounds were boron-hydrogen compounds, boranes, and compounds of boron, hydrogen, and carbon, known as carboranes. If boron's durable solidity and ignition resistance is a disease, compounds such as these are one way to cure it. Some of them are hypergolic in air, i.e., they light on contact with it, and don't need a spark. Elemental boron is not considered to be toxic. In its pure crystalline form it is chemically inert. It does not dissolve in water, nor in boiling hydrochloric acid. Mammalian digestive fluids include hydrochloric acid, but only dilute, and not boiling. The apparent absence of a history of toxic effects is consistent with an absence of toxicity due to being totally unassimilable. Boranes and carboranes smarten up this laggardliness too. They are neurotoxins that accumulate in the body with a halflife of several weeks. Reinterpreting solid boron's ignition resistance as a safety advantage makes one of those difficulties go away. Boron will burn, but not just anywhere. This means the extra chemical synthesis steps a motor fuel plant would have to do to make boranes or carboranes, instead of pure boron, are better left undone. This change of viewpoint prevents the production of the boron carbide Hawthorne mentions, if indeed it was ever produced. It is a very hard, motor-eating abrasive. By not making carboranes, we're clear of that problem. The nature of Hawthorne's other black beast, boria, is another thing we reinterpret. The thing about boria that made it bad for jet engines of the 1950s, and makes it good for us, is its high temperature stability as a liquid. In the flame that forms it, boria is a very hot gas. But a short distance downstream of the flame it condenses to droplets of very hot liquid, and these stick to metal surfaces and don't blow easily out the back the way products of hydrocarbon combustion do. The jet motors were envisioned as propelling long-range bombers, and (one would hope) the demand for propulsion energy for these is always a very small fraction of the total energy demand. So there was no reason to fear the jets could create a scarcity of boron. If the combustion products wanted to stay with the motor, this was just a big nuisance. We however want to satisfy a very large fraction of the world's future demand for heat in mobile heat engines with boron-oxygen flames. Conceivably these flames could run the world short of boron (see section Boron the Ubiquitous). An oxide that is easy to retain is just what we want, because we want to keep control of it, and recycle it. 28 June 1999 Added Introduction: infrastructure? Who needs it? New motor design footnote: why filter oxygen through silver? 29 June 1999 Expanded footnote: if silver-filtered oxygen is good in a boron motor, why not in all air-breathing motors? 20 July 1999 Corrected all boron fuel volume calculations to allow for porosity in fibre, spaces between spooled fibres, and mid-spool void. See density footnote. 26 July 1999 Revised flow calculation to take into account varying flow speeds at different depths in a thin film with laminar flow. New footnote on how boron fibre can burn. 2 September 1999 Added flame temperature estimate. Revised energy density comparison between cordwood and cordboron. Improved separation of fact and interpretation. Fixed broken footnote link. 24 September 1999 Revised numbers throughout to reflect Gibbs free energy, aka exergy, yields rather than enthalpies. Added periodic charts to present basic specific exergy and exergy density data. 5 October 1999 Moved much discussion of need for pure oxygen out of footnote and into motor section. Added new introductory section explaining why emissions freedom logically but indirectly follows from strong ignition resistance. Made all the yellow highlights on opening screen links. 18 October 1999 Minor changes plus footnote considering the law of the unbeatability of hydrocarbon fuel compactness and what may let boron violate it. 8 November 1999 New section currently called Boron the Wieldy with beginnings of discussion of boron infrastructure. 11 November 1999 New hydrogen comments in Boron the Wieldy. 16 December 1999 Fanciful domestic illustration of boron handling versus today's fuel handling added to Boron the Wieldy. Also revised figures for energy transmission efficiency of fuels over the ocean, and hydrogen liquefaction energy cost. Mention of oxide recycling added to the introduction. Significance of fuel involatility noted in Why Boron Motors Won't Emit and Boron the Unignitable. 24 December 1999 More internal links. Improvements to first paragraphs of Why Boron Motors Won't Emit. 21 April 2000 Added section on Boron Decombustion. 6 May 2000 Removed old stuff about an elaborate scheme to mold identifying marks into boria recycling forms so that they might remain a vehicle operator's property even if he set them down somewhere (e.g. while crossing the Sahara desert). 29 May 2000 Revised section Boron the Wieldy to reflect more comprehensibly the idea of efficiency that now is used to link to it from the opening screen. Adjusted numbers in Boron Decombustion for a revised enthalpy of formation of diboron trisulfide, -240.6 kJ/mol (80th edition CRC Handbook of Chemistry and Physics). 27 August 2000 Adjusted numbers in Boron Decombustion to show free energy rather than enthalpy changes. Added magnesium combustion image and video link to Why Boron Motors Won't Emit, and boron nonignition image and video to Boron the Unignitable, all courtesy of C. E. Jones of the University of Texas at Austin. 29 November 2000 Added sections Boron the Oxygen-Efficient and Purifying Air Oxygen On Board a Vehicle. 14 March 2001 Added boria photo. Added incomplete Linking Pages section, more to come. Corrected reference in Boron the Wieldy to marine oil tankers bringing "nothing" to oil wells. Actually they bring ballast water. 31 December 2001 More links in Linking Pages, please advise if yours is missing. Picture-free, concise version prepared for the 11th Canadian Hydrogen Conference June 17-20, 2001, Word format, available here. Revision of basic data presentation (e.g. Ash Volumes) using luminal intensities, showing boron rarely darkest (best) but always dark (good). Discussion of zinc's proposed service as an energy carrier. 12 June 2007 New picture of boron filament, discussion of lack of boron analogues to carbon monoxide. Hawthorne link updated. 15 August 2008 A thermal B2O3-to-B-and-O2 process different from that of Boron Decombustion was published July 11, 2008 in Cowan, G.R.L. (2008) ‘How fire can be tamed’, Int. J. Nuclear Hydrogen Production and Applications, Vol. 1, No. 3, pp. 235–248. One of the intermediary substances is suitable, more so than boron itself, for piling up at a temperate-zone solar power plant in summer so that boron production — or electricity production — need not slow down during the winter. 28 February 2009 Added discussion of how vanadium diboride might serve as fuel cell fuel.